Planting a tree is an investment in the future - both of your home landscape and that of the planet. As much as trees are able to take care of themselves once established, they may need your help along the way. Healthy, attractive mature trees are no accident. Left to their own devices they may develop poorly placed branches and have less than the best production of flowers or fruit. By training and pruning properly when your trees are young, you can establish a branch structure that will serve the tree for the rest of its life. Prune off the lowest branches as a young tree grows - the height of the first permanent branches depends on the species, but for most shade trees these should be at about one-third the expected mature height of the tree. Select for main scaffold the branches with a good crotch angle, which involves removing those that grow either too horizontally or too vertically, favoring those that have a roughly 45 degree angle. 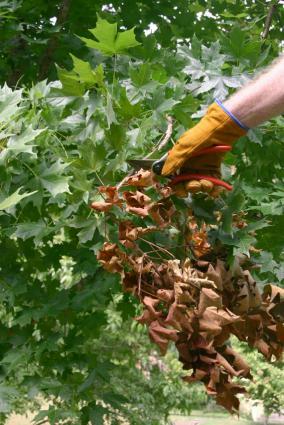 Remove dead and diseased branches, as well as those that grow toward the center of the tree. The goal is to have evenly-spaced branches and an open, symmetrical and uncrowded form. Never cut back the primary leader, the part of the trunk that grows vertically. This is called topping and results in a very awkward appearance in most species. Keep in mind that specific pruning and training requirements vary by species. Fruit trees, for example, require special pruning to favor the fruiting wood of the tree. Other trees, such as crepe myrtle, are tolerant of being cut back from the top on an annual basis (called pollarding), a technique which can be used to maintain a compact form, encourage prolific flowering, and reduce the mature height of the tree. Trees vary tremendously in their water requirements, from complete drought tolerance to needing constantly moist soil. Inform yourself of the needs of your trees and give them the water they need to avoid stress, which opens the door to disease and a host of other problems. Be careful not to over water - it is just as detrimental. Drought tolerance increases with age as the tree roots go deeper where the soil is more likely to stay moist. In the first few years after planting, however, regular water will be needed for the vast majority of species. Only water when the soil is dry - i.e.. not during cool, rainy weather. A general rule of thumb is to water one inch per week for the first growing season, two inches every other week in year two, three inches once every three weeks in year three and then four inches once per month on an on-going basis (if needed). 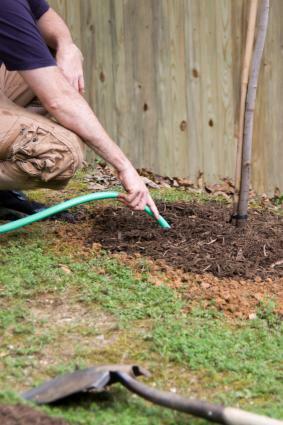 By watering less frequently and more deeply over time, you will encourage the roots to go deeper, improving the anchorage of the tree and improving its drought tolerance in the long term. The root zone typically extends slightly beyond the area covered by the canopy and this entire area should be evenly saturated. The easiest way is to use a small adjustable hose end sprinkler on a circular spray pattern. Some trees can tolerate the constant spray of the pop-up sprinkler systems used for lawns, but in most cases this should be avoided, if at all possible. Keeping the trunk wet is a sure way to encourage fungal disease in the root crown, which can be fatal. Except for trees that are adapted to boggy conditions, like willows, it's crucial to allow the top six inches of soil to dry out between waterings. It doesn't hurt to fertilize trees, but it's less important than cultivating healthy topsoil. This is largely a matter of work that is done before planting, but spreading a layer of compost over the root zone on an annual basis can slowly turn any soil into the high quality topsoil that is capable of sustaining lush, healthy growth over the long term. Maintaining a layer of mulch several inches thick over the root zone is a simple way to slowly improve soil. Like compost, it slowly breaks down to enrich the soil with humus, the substance that gives topsoil its water- and nutrient-holding capacity. 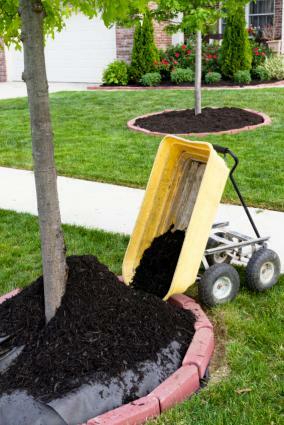 Mulching also has the added benefits of keeping the roots cool and conserving soil moisture. Just be sure to avoid letting it pile up directly against the trunk of the tree. If you do choose to fertilize, make sure to use a balanced fertilizer, such as 10-10-10 or any product where the three numbers indicating the relative quantity of major nutrients are roughly equal. The fertilizer should only be applied once active growth has begun in spring and all danger of frost is passed. 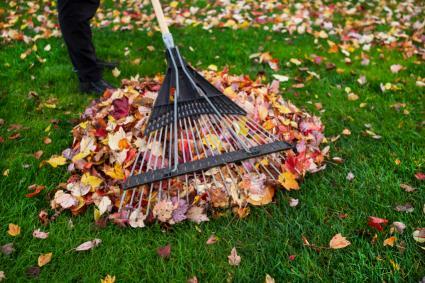 Cease fertilizer application about eight weeks before the first expected frost in fall, to allow the wood to harden off, making it less likely to suffer freeze damage in winter. There are many forces of nature that can damage an otherwise healthy tree. Learn the most common ones, along with tactics to prevent them. 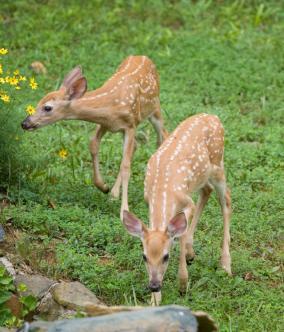 Deer - There are scent-based repellents that discourage deer, but they are not foolproof and must be reapplied after every rain. Fencing, whether around individual trees or around larger areas containing multiple trees, is a much more secure form of deer protection - but only if it is at least seven feet in height. Gophers and moles - If these ground-dwelling critters are present, it is a good idea to plant trees with their roots in a basket of poultry wire or hardware cloth. This can also be added after the fact by digging a trench two feet deep around the periphery of the root zone and lining it with the same wire mesh, leaving about six inches above ground to keep the critters from going over. Birds - Bird protection applies only to fruit trees and is only necessary for the brief period that the fruit is ripening; bird netting (a plastic mesh) can be draped over the tree during this time, though it is really only feasible on dwarf trees. Rodents - Rats like to chew the bark of young trees, which can girdle and kill them in a short time. However, this is easily prevented by creating a cylindrical collar of wire mesh around the base of the trunk. Young trees generally need staking to prevent them from blowing over in storms. A stout wooden or metal stake pounded into the ground on either side of the trunk (about one foot away) is generally sufficient. Attach the tree to the stakes with rubberized tree ties or use an old inner tube to prevent the ties from gouging into the bark. In extremely hot climates, tree trunks need protection from the sun when they are young. In the past this was accomplished by painting the trunk white with a special paint, but now special tree wraps are available at garden centers for this purpose. Trees become more cold-hardy as they age. For species planted near the edge of their cold hardiness zone, it is helpful to offer them some sort of protection on the coldest winter nights. This can be as simple as throwing an old sheet or tarp over the canopy, which will offer a degree or two of frost protection. Anchoring the frost cover to the ground with stakes to prevent cold air from seeping in from below adds another couple degrees of protection. Stringing Christmas lights inside the covering adds even more warmth. In northern climates it is customary to wrap tender species in burlap for the entire winter. Trees that have adequate moisture and deep topsoil rarely suffer from serious pest or disease problems. And when they do, it's generally necessary to hire a licensed arborist to treat them, except in the case of very small trees. To be healthy, a tree needs to be planted in an environment that it is suited to, in terms of sun exposure, climate and soil type. One thing to watch out for, however, is micronutrient deficiency, as this can leave a tree weak and vulnerable to pests and disease. Trees planted in good quality topsoil with ample organic matter rarely suffer from a lack of the primary nutrients - nitrogen, phosphorus and potassium - but certain trees have special requirements for other minerals, such as zinc, iron, boron, and manganese. The deficiency generally shows up as discoloration or deformation of the leaves. It is possible to consult books to analyze the problem and figure out how to resolve it, but the the national network of cooperative extension service offices offers this service for free. They will also perform soil tests for a small fee and help pinpoint exactly the type and quantity of nutrients that are needed. Trees coexist with pests and disease to a certain degree without causing long term harm. For example, aphids attack many trees, resulting in a sticky substance being secreted under the tree. The tree may be able to handle cyclical aphid infestations - it is more likely that the bigger problem will be the mess that they cause. Caterpillar infestations are also common on some trees, such as oaks. 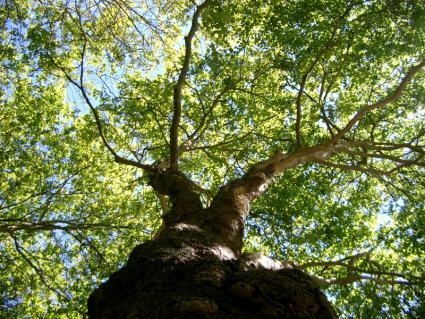 They may entirely defoliate a tree every few years, but this actually a natural cycle that is responsible for nutrient cycling and other aspects of maintaining the overall health of the tree. For cosmetic reasons, spraying pesticides may seem like an attractive solution, but it usually best to leave the pests to their natural cycle, if at all possible, and instead focus on preventative measures that support the overall health of the tree, such as those listed above. If in doubt, contact a professional arborist for advice. One final note is to practice good hygiene with trees that are prone to pest and disease problems. Many fruit trees are prone to fungal invasions, for example, which can be lessened if the leaf letter and rotten fruit is cleaned up and disposed of each year. It's also a good idea to keep pruning equipment sterilized by dipping it in a 10 percent bleach solution. Trees provide shade and food for people and wildlife, and have an intrinsic beauty in the landscape. They are largely self-sufficient once established but over the course of their lives, humans have an important role to play in giving them a little help to stay healthy.